It’s no exaggeration to state that Ireland’s homes are full of badly insulated pipes. The only time this scandal of bad insulation grabs the headlines is when we have a really hard frost and pipes that we thought were insulated burst and destroy ceilings, furniture and homes across the land. Insurance companies get stuck with bills for millions and homeowners get stuck with the nightmare of cleaning up.If you want your pipes in your home to be protected from all that mother nature can throw at them then the next paragraphs you read will be the best time you have ever spent. If your home, industrial and office building has pipe work, either hot water or cold water that needs the protection of a world class insulation then you just gotta learn these insider secrets about pipe insulation that the industry experts would want you to pay them thousands for. "In this report we will explain to you why so many pipe insulation systems actually end up sabotaging the very pipes they were put there to protect"You will be shocked to learn how so many pipe insulations have a design weakness that simply sets them up to fail, inevitably, and the results can be disastrous and cost thousands to repair. Plastic and copper piping has become almost standard in many homes, office and buildings, because its economical and fast to install. Plumbers love putting in plastic and modern thin wall copper piping for your hot and cold water because Snip, Snip Push Fit and its done. Fast and Furious right? Well yes, until it comes to the insulation bit, and then it’s slow, slow slow. Plastic or copper pipes in your walls are floors are a real pain to insulate using traditional methods. The problem starts with their round shape and ends with them having the downright bad manners to ‘snake' around your walls and attic spaces like they owned the place. "Most pipe insulations are those “neoprene” rubbery sleeve types, that are slit along the length of the insulation. Your plumber then slips the rubbery insulation over the run of pipe and then tie wraps the insulating sleeve along the pipe. So think about that for a moment. Your pipes are being insulated by a sleeve that has a slit in it from end to end, because, let’s face it, there is no other way to pull on these insulating sleeves. Hey that’s like pulling on your socks only to find that someone has slit them from the toe end right up to the open end. You’re feet wouldn’t feel very warm in those socks on a winters morning Right? “But wont my woolly and board insulation that’s in my wall cavities, and ceiling cavities insulate by pipes by ‘accident’ or by proxy?” You’re thinking that if there’s insulation in there, sort of,near your pipes but not around your pipes the jobs done. Right?Wrong!Let us put that logic to the test, by an example. You’re lying in bed nice and cosy under the duvet and your partner turns over and pulls the duvet, half off you. Now you’re lying there with the duvet half on you and half off you. How warm do you feel now? How well insulated do you feel? Well its kinda like that for your pipes as well. Its a proven scientific fact that insulation that has joints, joins or gaps in it under performs dramatically by as much as 30%It sounds like an impossible task then to insulate pipes properly. The challenge of getting an insulation system that will go in around each and every pipe and seal around them 100% without any seams, without any joints is impossible?. Not So. 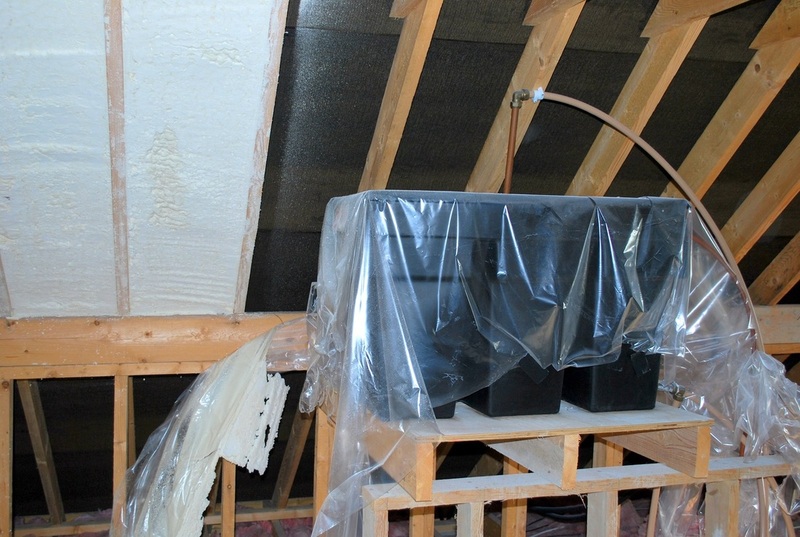 There is one insulation that’s up to the job and it’s Fusion Spray in Place Foam Insulation. What Spray in Place Foam insulation does dastardly cleverly, most other insulations could only wish to do. It’s sprayed on as a liquid, into your stud walls, you attic and ceiling cavities, and then it expands, and expands and expands several hundred times its original volume . Our SUPERINSULATING foam seals, fills squeezes into every opening, every hole in your joists, and here's the good news, around your pipes, seamlessly, in an airtight envelope.You’re pipes will be sealed and insulated like they came straight from the factory that way, and your plumber will love you for it. No more cursing or swearing for him. You will notice the difference in your home immediately. You hot water will run hotter, your hot water cylinder will take less time to get your cylinder up to temperature and you’re home heating delivery guy will sulk and have that ‘basset hound’ look on his face, because he doesn’t get to visit you as often as he used to. But there’s more good news and it has to do with the noises pipes make. For most of us the first time our pipes announce themselves in our homes is when the heating goes on. The first noises we usually hear is “gurgle gurgle whiz whiz”, then its “click click clunk clunk “ as our pipes expand and as air trapped in the pipes gurgles through all the pipework. It can be quite an orchestra. The problem is caused by uninsulated pipes creaking, groaning and straining against timber work and floor joists hidden in your walls, ceilings and floors. How’s that good news? You ask. The good is that Fusion Spray Foam can stop all that pipe orchestra because Spray In Place Foam is a Scientifically tested and proven fantastic acoustic insulator so your pipes will get the sound absorption you’ve always dreamed of . all for the price of just one of those fantastic benefits we’ve just described.